MAJOR ANNOUNCEMENT: 2019 BASEBALL CANADA CUP IN REGINA Aug 7 - 11 !!! Announced by Regina Mayor Fougere, and Baseball Canada Exec Director Baba!!! Video and Prelimary Information! MAJOR ANNOUNCEMENT: 2019 BASEBALL CANADA CUP IN REGINA Aug 7 - 11 !!! Announced by Regina Mayor Fougere, and Baseball Canada Exec Director Baba!!! For Immediate Release: From Economic Development Regina Inc.
REGINA – Baseball Canada has declared Regina as host city for the 2019 Baseball Canada Cup U17 Championships August 7-11, 2019. Taking place at Optimist Park and Currie Field, this premium championship event will showcase the Nation’s best in baseball aged 17 and under. In addition to the national attention Regina will receive, the tournament is also estimated to have an economic impact of $1 million on the Greater Regina Area (GRA). Participants and their families from across the country, along with scouts and spectators, will take in all that Regina has to offer next summer. The Baseball Canada Cup serves several purposes: to scout and select players for the National Junior team, to evaluate coaches and identify potential Junior and Senior team coaches, and to evaluate umpires. College, amateur and professional scouts will have the opportunity to evaluate the next generation of elite Canadian baseball talent. “The Canada Cup event started in 1989 and it brings together the best U17 players in the country to play for this prestigious national championship. The event is followed by MLB scouts, college recruiters and other recruiting programs. Some of the most recent MLB players have played in the event including Russell Martin-Jays, SK’s own Andrew Albers- Orix Buffaloes of NPB, so if you are in the Regina area, you should plan to attend this event because you will likely be watching some future MLB players,” said Jim Baba Executive Director for Baseball Canada. Currie Field and Optimist Park are Regina’s premiere baseball facilities and have hosted numerous large-scale tournaments on both the provincial and national stage. Optimist Park will be undergoing significant renovations to prepare for this major event and other tournaments throughout the summer. 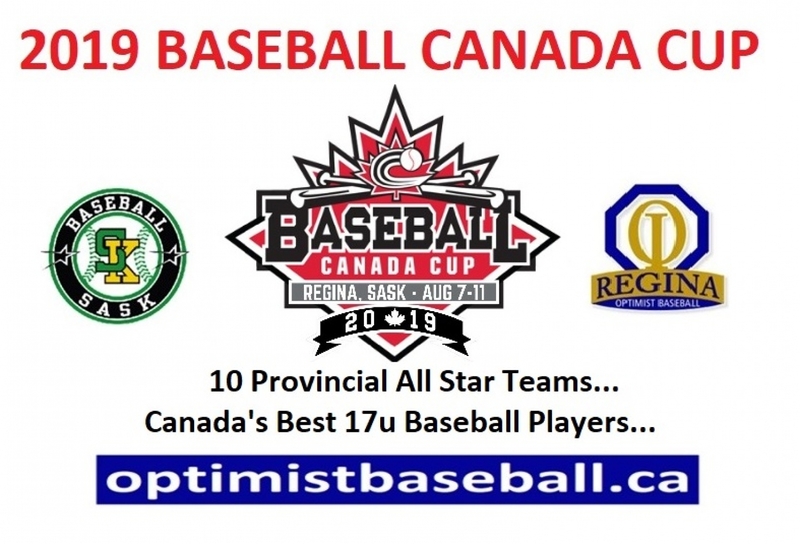 “Hosting the Baseball Canada Cup is a great opportunity for the Regina Optimist Baseball Association to promote minor baseball while providing fans from across Canada a great venue to watch talented ball players work towards college, amateur or professional careers,” said Rod Palanuik President of the Regina Optimist Baseball Association. Events Regina is a collaborative partnership led by Economic Development Regina and the Regina Hotel Association with support from partners Evraz Place, City of Regina, Tourism Saskatchewan, Wascana Centre and the University of Regina. The partners work collaboratively to aggressively promote Regina as a leading Canadian destination for events and to tactically pursue event opportunities. The 2019 Baseball Canada Cup will add to the impressive list of major sporting events Regina has recently hosted, which includes the 2018 Tim Hortons Brier, 2018 Mastercard Memorial Cup, and 2018 CP Canadian Women’s Open. For more information on the 2019 Baseball Canada Cup, visit www.baseball.ca. Federally incorporated in 1964 as the Canadian Federation of Amateur Baseball, Baseball Canada is the national governing body for baseball in Canada and is made up of 10 provincial associations representing players, coaches and umpires nationwide. Baseball Canada is a member of both the Canadian Olympic Committee and the World Baseball Softball Confederation (WBSC). It is funded and recognized by Sport Canada and Canadian Heritage and is recognized by Revenue Canada as having charitable status. To organize and promote minor baseball for the good of the players, coaches, parents and fans; To institute and regulate city league, provincial, and national competition – aged 20 years and under in the city of Regina and province of Saskatchewan. We are a non-profit organization, park and website, run by a board of directors. We are dedicated to family friendly values, and people of all ages are welcome to the Regina Optimist Baseball Park. We are a volunteer organization, intent and focused on the promotion of amateur baseball. We sincerely thank our past, present, and ongoing supporters, sponsors, and volunteers, for their contributions, which, the organization, park and website depend upon. Our baseball games, tournaments, training camps, umpires, and coaching rules and policies, are guided by Baseball Sask rules, regulations, and baseball divisional categories. Coaches and parents actions and instructions, must be tempered towards good conduct, welfare, and fair competition, of the players. Economic Development Regina Inc. (EDR) is the economic development agency for the Greater Regina Area. EDR is a not for profit economic development corporation, governed by a volunteer board of directors. EDR provides leadership to the community to support industry growth and diversification through retention and expansion of existing business and encouraging investment, development of industry and tourism. In collaboration with key stakeholders, we work to identify, develop and promote opportunities that advance economic prosperity and ensure the Greater Regina Area offers a vibrant and diversified economy for investors, is a positive destination experience for visitors and offers a high quality of life for residents.